For the fifth straight year, 1978-79 O-Pee-Chee Hockey featured a 396-card base set. Once again, they featured a white-bordered design and the same information on the fronts that the previous years' sets had. At the same time, they largely copied the companion set issued by Topps the same year and the subsets were recognizable to long-time collectors. Some found it familiar, but others found it pedestrian. 1978-79 O-Pee-Chee Hockey cards feature a player photo that is either posed or taken during a game. All the rest of the information appears at the top of the card. In the upper left corner is a team logo and position. The team name is just outside, in its one curved box. That player's name runs across the top of the card, above the photo. The backs are oriented vertically, with a box of the player's vital stats running across the top. The card number appears inside a skate icon, with the player's name beside it. Another box contains year-by-year statistics, including minor league seasons, and a short biography in both English and French if there was any empty space. At the bottom is a facsimile autograph. The first five cards in 1978-79 O-Pee-Chee Hockey feature highlights from the previous NHL season. League leaders in several categories appear on cards 63 through 70. Team pictures appear on cards 192 through 208 and are arranged alphabetically by city. Cards 262 through 264 recap the semifinal series and Stanley Cup Finals. All-Star players are featured on cards 325 through 336. Card 300 notes Bobby Orr's retirement that season, and three cards features checklists. 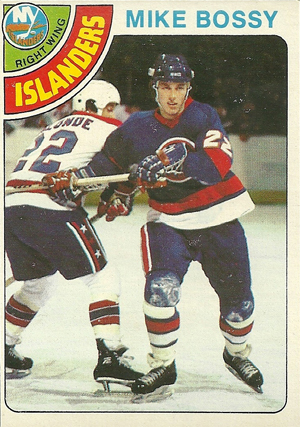 The key card in 1978-79 O-Pee-Chee Hockey is the Mike Bossy rookie card. Other notable rookies in the set include Bernie Federko, Randy Carlyle, Ron Duguay, Brian Sutter, Dave Taylor and Doug Wilson. Very useful for the beginner.